Welcome to the Ride on Smoothie & Juice Bar blog! We will use this space to share delicious smoothie recipes, tips and tricks for making the best açaí bowls, helpful information about juice cleanses, and so much more. As the best smoothie place and pressed juicery in Columbus, GA, we want to share our knowledge to help create a healthier community. But before we dive into all the delicious fruit smoothies, smoothie bowls, cold-pressed juices, and healthy snacks we offer, here is a little more information about us! Ride on Smoothie & Juice Bar is a local smoothie shop that brings deliciously healthy drinks to the Columbus bike shop, Ride on Bikes, and the gym, Max Fitness Elite. For years, we’ve been handcrafting fruit smoothies and pressed juices using a majority of organic produce and fresh ingredients from local farms. We believe in supporting local businesses in our community, and it serves us well that the organic fruits, veggies, herbs, and other products we source locally are some of the best we’ve ever had! For us, it all comes down to creating the best smoothies and fresh-pressed juices in the area, while giving back to the community in the healthiest way possible. 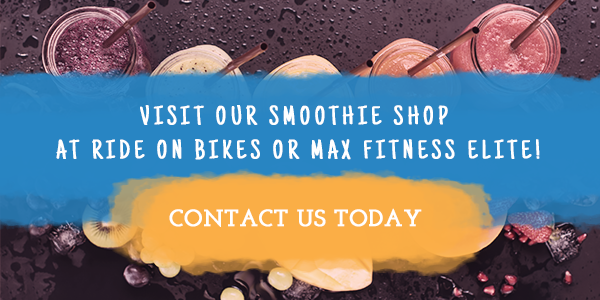 Our smoothie shop and pressed juicery is located inside a bike shop and gym, making us the healthiest place in town! Whether you’re fitting in a workout, getting a bike tune-up, shopping for a new cruiser bike, or just peek your head inside when you ride on by, we are here and ready to serve you. There’s just something about getting a refreshing fruit smoothie or refueling with hearty açaí bowl while on a bike ride with your friends, so consider us the smoothie place for all your pit-stops. We know our menu is chock-full of delicious options, so don’t be afraid to ask us for a recommendation if you need to recharge and aren’t sure what to order! Smoothies, Açaí Bowls, Cold-Pressed Juice & More! 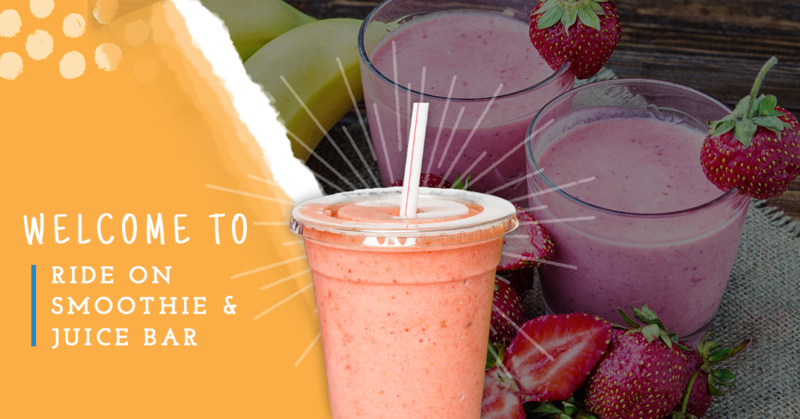 At Ride on Smoothie & Juice Bar, we are always creating new smoothies and fresh-pressed juices for customers to try, and we truly have something for everyone! Our menu boasts a nice balance of refreshing fruit smoothies, protein smoothies, and vegan smoothies made with all-natural ingredients. Customers can also add a nutrient boost or shot to make their smoothie extra healthy, whether that be chia seeds or flax seeds (for digestion), whey protein or vegan protein (for energy), bee pollen (for immune system support and allergies), cacao (for detoxification), and the list goes on. 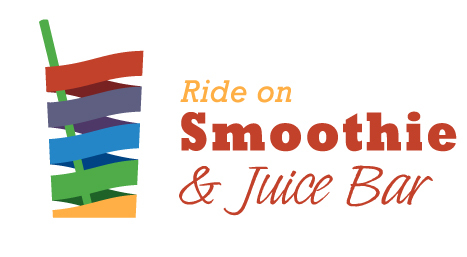 Visit Ride on Smoothie & Juice Bar in Columbus today to try one of our famous fruit smoothies — we haven’t even mentioned our Almond Joy, Reese’s, PB&J, Blueberry Pancake, and Thin Mint smoothies! Plus, we always have a monthly special, so don’t forget to ask what special drink we came up with this month when you visit our smoothie place. Part of what makes Ride on Smoothie & Juice Bar the healthiest place in town is that we also offer fresh-pressed juice and organic juice cleanses at our smoothie shop! We know how good it feels to reset your body with a juice cleanse or just to start your day with something healthy to sip on, so feel free to stop by our pressed juicery at any time to try some of our organic juice. We offer single-serve juices and juice cleanse packs to get you through your three to five-day juice diet, making us the best juicery in town. We are also known for our juice cleanses, which can take some of the work out of your 3-day juice cleanse or 5-day juice cleanse. Give yourself a break from the cold-press juicer and pick up a six-pack from Ride on! Our juice cleanse packs can include one energy juice (Tooty Fruity or Tropical Splash), one detoxifier juice (Beetlejuice or Can’t Beet It), two daily greens juices (Veg Out or Kale Yeah! ), one Joint Juice, and one C-Ya! Juice. If you are on a juice diet, we recommend drinking one juice every two hours for three to five days. Ready to try one of our gourmet smoothies, fresh-pressed juices, or a smoothie bowl (with delicious toppings like honey, granola, coconut flakes, cacao, and fresh fruit)? Stop by Ride on Smoothie & Juice Bar at Ride on Bikes or Max Fitness Elite today to see why we’re the healthiest place in Columbus!